Sue has been performing as a handbell soloist since 1993. She is a resident of Slippery Rock, PA and rings in the East Main Presbyterian Church bell choir. She is a member of Handbell Musicians of America. Sue is an active soloist and clinician, working with both ensembles and soloists. In 2000 she was a featured soloist at the National Director's Seminar in Dayton, Ohio, and the winner of the Handbell Exploration Solo Competition in Cleveland. In July 2002 she returned to Cleveland Expo for a Spotlight Concert. She also worked with a newly formed handbell choir in Kiev, Ukraine while presenting concerts in Kiev and Presov, Slovakia. Sue was a member of the 2003 Dream Team quartet which performed at the Solo-Ensemble Extravaganza (SEE) in Colorado Springs. This same quartet premiered Kevin McChesney's arrangement of Claire de Lune at the 2004 Area X festival in Durango, Colorado. Sue has been a featured soloist at many concert venues throughout the United States including the International Symposium in Orlando, Florida and the National Pinnacle Events in Nashville, TN and Dallas, TX. 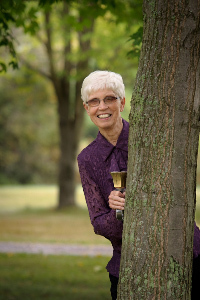 Sue currently devotes most of her time to handbells, both as a clinician and solo artist. She is the author of two articles on solo handbell techniques and thirteen of her solo handbell arrangements have been published. Her repertoire includes a wide variety of sacred, secular and classical music and she delights in presenting the artistry of solo handbells.